The T600/T600e, previously the Tennant’s 5680 floor scrubber model, is a compact walk behind floor scrubber that promises excellent cleaning performance for daily use in the toughest applications. This indoor battery-powered floor scrubber, with durable engineering, will boost your cleaning productivity and reduce your cost to clean. With a variety of custom options, like multiple cleaning heads, you can select a floor scrubber to fit your specific floor cleaning needs. Clean longer and more efficiently with the T600/T600e’s large capacity 32 gal/121L solution tank and a 37gal/140L recovery tank. The T600/T600e’s estimated coverage is up to 34,964 sq. ft. with a run time of up to 6.9 hours. Similar to the Tennant 5680, the Tennant T600/T600e is battery operated. Customize the cleaning path (28,” 32,” or 36”) depending on the scrub head (disk, cylindrical, or orbital) and your specific application. Also, when you’re finished scrubbing, the T600/T600e cleanout is simple with the recovery tank on top, solution tank on the bottom, easy access to the solution filter bowl, and a convenient onboard charger. The T600/T600e mimics the industrial grade construction of the 5680 floor scrubber. 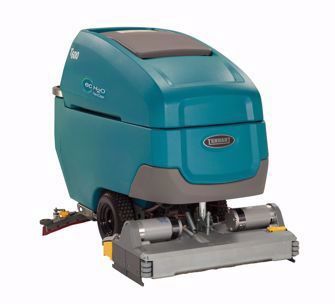 Featuring a corrosion-resistant scrub deck and rust-proof polyethylene body and tanks, this floor cleaning machine is built to perform and last years to come. Smart-Fill- Maximize battery life and run-time with the optional Tennant Smart-Fill™ automatic battery watering system, eliminating the task of checking, opening, and filling flooded batteries. ecH2O NanoClean Technology®- Electrically converts water into an effective, money-saving, environmentally friendly cleaning solution that cleans while saving money compared to daily cleaning floor chemicals and processes. IRIS Asset Manager®- Make informed decisions with intelligent insights. Scrub path: 28", 32", and 36"
Battery run time: 6.9 hrs. Weight (with heaviest batteries): 1,052 lbs.